Run your first 5K of the super-early spring season in Salem. Join the more than 200 runners already signed up to share the love at the inaugural SMS 5k Love Run and 1-mile Fun Run beginning at 9 a.m. on Feb. 16. 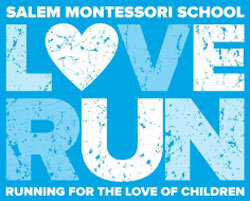 Honoring the 25th anniversary of Salem Montessori School, this race will start and finish at Moyer Park on the greenway in Salem. A portion of the proceeds will benefit Children’s Trust of Roanoke. And there’s plenty of fun at the finish with photos, s’mores, hot chocolate, and a finish line party that are all part of this Valentine’s Day-themed event. You can plan your spring and summer running season now. Find a list of all the races in the Roanoke Region here.